Outdoor Advertising is a distinct medium and creative messages should be specifically geared to this format. Your message is extremely important to the overall success of your campaign. Please review the following guidelines and consider them for your display design. If you want high visibility, high contrast is the key. (Like a wristwatch) than to make a large object small (like a building). 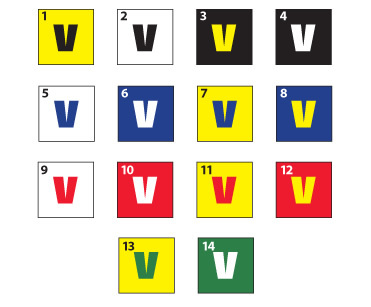 The chart below ranks the 14 most visible color combinations, with 1 being the most legible. • Avoid spelling out complete sentences. Don’t use eight words when four will do. • Stick with shorter, simple words to maximize quick comprehension by motorists. • A single message idea will read quicker and more easily than trying to combine multiple offers. Large text will allow fans to see your message from a greater distance. If your text is too small, it will be too hard to read. Your audience is then likely to disregard your messages entirely. Although capable of much smaller, we recommend a 12” character as a minimum. Three foot text, and larger, would be optimum. • JPG, BMP or GIF for still image content at 100% quality; Use RGB color, not CMYK. • Artwork Size and Resolution: 2x the sign’s pixel dimensions at 72 dpi. No more than 10 words total, and only five words in a headline. Use short words for faster comprehension. Remember these are viewed from 400 to 800 feet away. At 600 feet, thin lines optically disappear. Being subtle at 600 feet just means it doesn't get noticed. Focus on one key objective. Don't distract the viewer with multiple messages. Can you read the copy clearly? This simulates viewing from the road. Did they understand it? This simulates driving past the billboard.